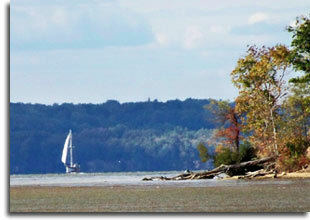 On the Potomac River at Wades Bay, the area is perfect for hunting, bird watching and fishing. Fossilized sharks teeth, bones and shells are often found along the water's edge. A good place to spend some time in nature. There are some nice walks and you can go hunting for shark teeth. It's a nice place to spend the day! Went about 4 hours after high tide and within minutes we were finding shark teeth and fossils. Ended up with over twenty shark teeth in about an hour. Bring a bag and something to sift the sand with.